In case you haven’t been paying attention lately, there are now 12 breweries within Boston’s city limits. Fourteen if you include Clown Shoes (now owned and brewed at Harpoon) and Naked Ox (a Boston-based brand that’s contract brewed at Dorchester Brewing Company). And four more are on the way: Distraction Brewing is targeting a January debut in Roslindale, Night Shift recently received its ABCC license for the pending Lovejoy Wharf location, Bruno’s Brewery (an offshoot of Boston Winery) could soon start brewing at its facility in Dorchester, and Brato Brewhouse & Kitchen is poised to begin construction on their space in Brighton any day now. 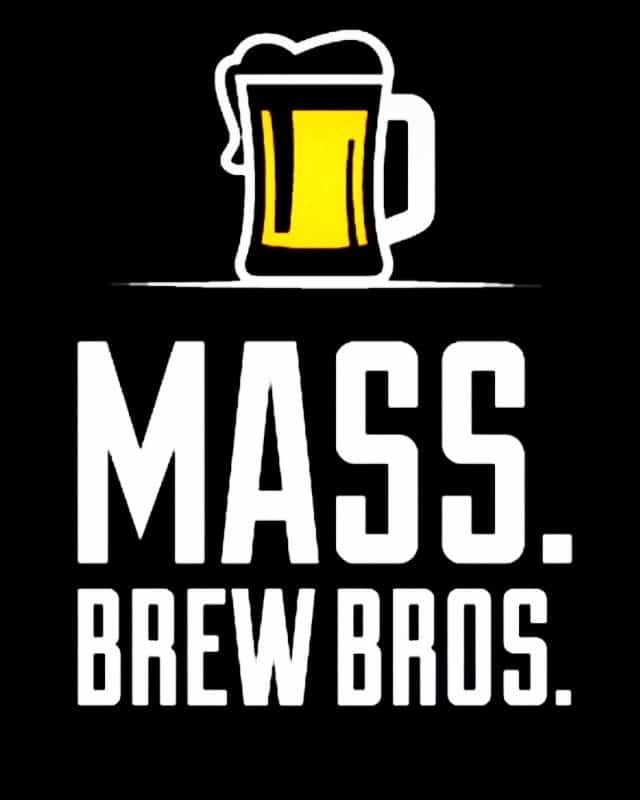 With so many options available, we figured both locals and visitors alike would be keen to know who’s currently pouring the tastiest Porters and Stouts in Boston. 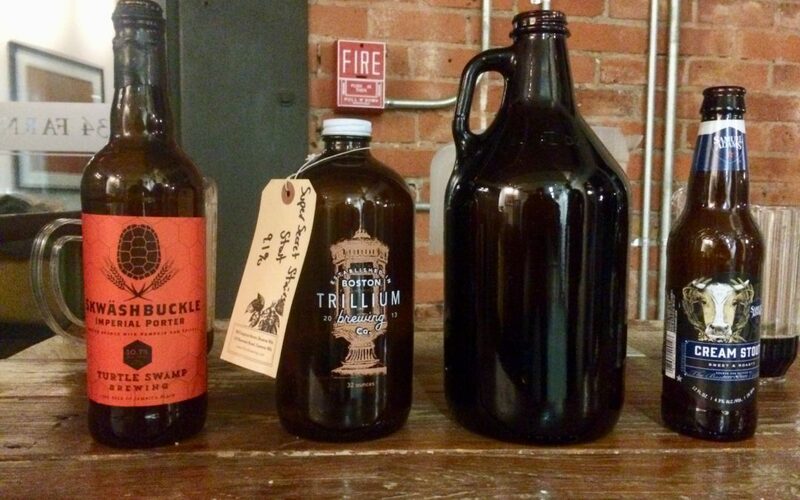 Besides, it was time we focused one of our blind tastings exclusively on the city’s flourishing brewery scene. 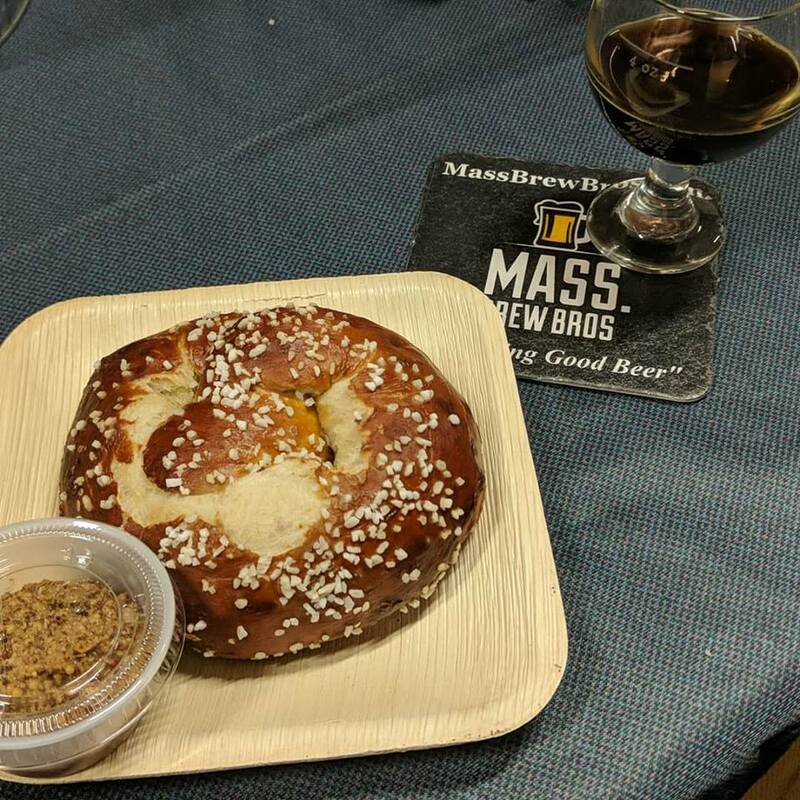 So last Sunday we invited 20 of the city’s best-known craft beer drinkers to join us at Craft Beer Cellar Fort Point to taste our way through all the Boston-brewed Porters and Stouts we could get our hands on. The field included a variety of offerings, 12 in all, from every brewery in the Hub except Cheeky Monkey and Deadwood Brewery at Boston Bowl, neither of which had a Porter or Stout available at the time of our event. 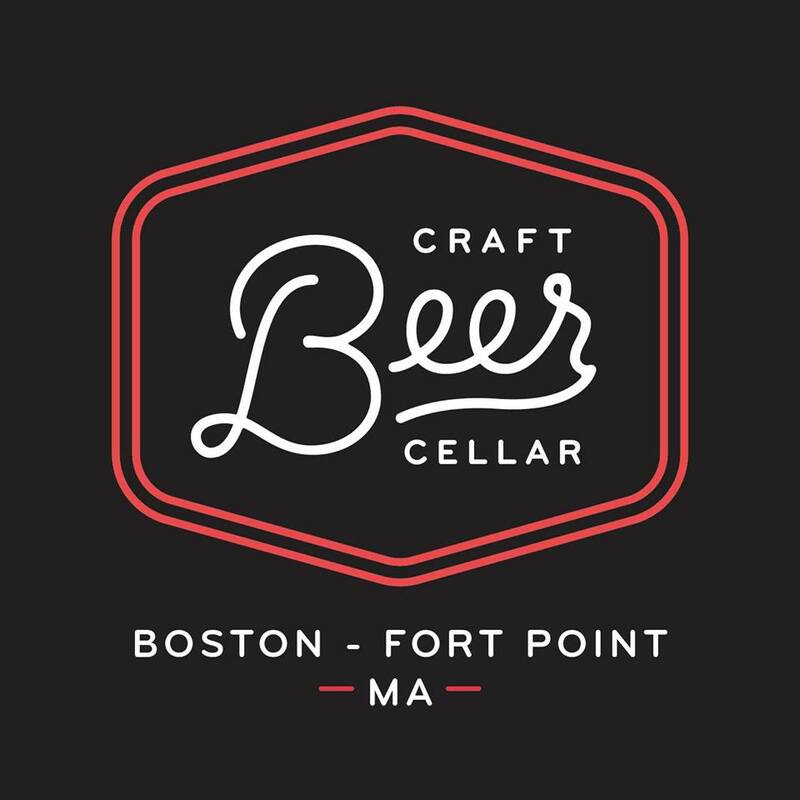 Our blind tasting of Boston-brewed Porters & Stouts was hosted by Craft Beer Cellar Fort Point, located at 34 Farnsworth Street next to Trillium. Their mission is Amazing beer, Hospitality, and Education. Our star-studded tasting panel was made up of social media bigwigs Boston Attitude, Raising the Barstool and Pork and Pints Boston, event specialist Christine Healy from Craft’d Company, Boston Magazine’s Jackie Cain, professional brewer Isaac Boucher, Got Hops blogger Ed Gebo, beer reviewers Boston Beer Guy and Dave’s Beer Report, and many of the city’s beer-drinking creme-de-le-creme including Boston Beer Girl, Pints on the Pike, Photos by Fletch, Boston Jocelyn, Fenway Seth, Kyle Robidoux, the Brewery Babes and the Boston Beer Bros.
Entrants in the Traditional Porter & Stout field included Democracy Brewing’s 1919 Strike Stout* (crowlers), Sam Adams Cream Stout (12-ounce bottles), Seaporter from Hopsters (crowlers), and Excellent Porter from Beerworks (growler). Try as they might, tasters couldn’t decide between the rich and creamy Sam Adams brew and the dark and toasty offering from Beerworks, so sent them both through to the finals. Last but not least was the Specialty Porter competition, pitting Skwäshbuckle, Turtle Swamp’s Imperial Porter (22-ounce bottles), against Roasted, an American Porter with bourbon barrel-aged coffee from brewery-in-planning Time & Materials Beer Co. (16-ounce cans), Harpoon’s Dunkin’ Porter (12-ounce bottles), and another Sam Adams entrant, Honey Porter (16-ounce bottles). Turtle Swamp’s rich and hearty 10.7% ABV offering had little trouble advancing. With the winners of each category having been crowned, it was time to pit them against each other in one final best-in-show taste off. In addition to the dark and delicious brews, Fat Boyfriend Bakery, provided our tasters with an amazing array of their scrumptious soft baked pretzels. If you don’t see them at your local craft brewery taproom request them by name. For this final round we poured one more sample of each of the finalists and asked tasters to pick their favorite. The Cream Stout from Sam Adams and the Excellent Porter from Beerworks each received a handful of votes, but the majority of panelists favored the richer imperial versions from Trillium and Turtle Swamp. In the end, Skwäshbuckle edged out Super Secret Stairs for the victory. 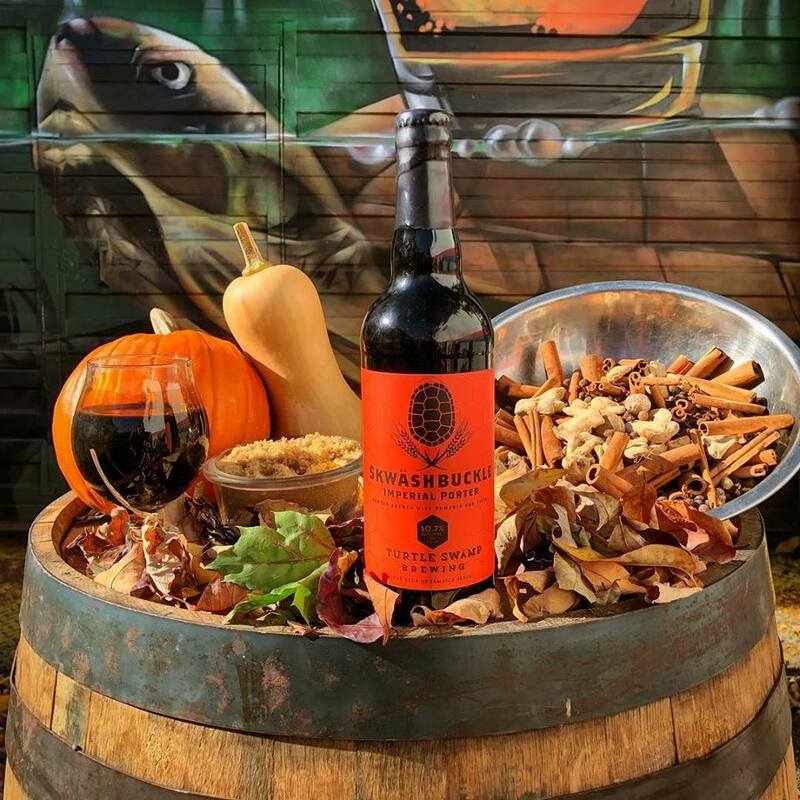 Its complex combination of locally grown squash, classic fall spices, dried fruit, light notes of brown sugar, and a hint of heat made the once-a-year limited offering irresistible. Available in 22-ounce bottles and on draft at its Jamaica Plain brewery, hurry over before it runs out. Head over to the Roslindale Substation this Friday for the debut of Turtle Swamp’s newly announced pop-up beer hall and you may be able to get a pour of our blind taste test winner of Boston brewed Porters & Stouts. *DBC’s Kettle Soured Dry Stout and Democracy’s 1919 Strike Stout are served on nitro. We convinced both breweries to fill up a couple of crowlers an hour before the tasting, but the delicious creaminess didn’t hold up the way it does when you sip one fresh from the source (which we highly recommend that you do). Our apologies to both breweries, and lesson learned.